Joanne graduated from Canada's National Ballet School,Teacher Training Course. She later completed an MA at the Laban Centre in London. 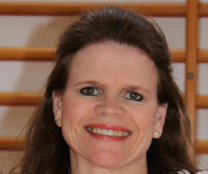 Joanne has taught ballet internationally in both recreational and professional schools. She has worked extensively in dance education to devise and deliver projects that enabled people of all ages and abilities to access classical ballet and participate in the work of professional dance schools and companies. She was Head of Education at English National Ballet and has worked freelance as an education consultant for various organisations including The Royal Ballet School and The Royal Opera House. Joanne joined the Kentish Town Dance for Parkinson’s class as a teacher in January 2009, motivated and inspired by attendance at workshops with the Mark Morris Dance Group in London and New York. She is co-founder of the charity, Musical Moving, where she works to promote the joy of dance to people living with Parkinson’s. Musical Moving also supports students, teachers and volunteers in London who are interested in learning more about working with dance and Parkinson's. Joanne teaches with Anna Gillespie in Camden and Wimbledon and has taught with David Leventhal and UK colleagues at annual summer schools to introduce dance for people with Parkinson's to new teachers. In 2010 Joanne co-taught dance workshops at the World Parkinson's Congress in Glasgow. In 2015 Joanne and Amanda Fogg devised and taught workshops in Sweden to introduce dance for people with Parkinson's to new teachers. Joanne is a founding member of the Dance for Parkinson's Network UK. Together with colleagues she set up the Network to support the growth of classes around the United Kingdom. Anna is one of the founder members of the Kentish Town, Musical Moving Dance for people with Parkinson’s group, together with Dr Marion North and Marina Benini and Joanne Duff . She is also a founder of the Dance for Parkinson's Network UK. She trained in both music and dance and graduated with a BA (Hons) from the Laban Centre. Anna has worked as a dancer, composer and musician for various contemporary dance companies. She has also devised and taught “music for dance” courses at the Royal Academy of Dance and Roehampton University. Anna regularly accompanies professional dance classes including the Richard Alston Dance Company and education projects with The Royal Opera House and The Royal Ballet School. In recent years Anna has concentrated particularly on how music can facilitate, stimulate and encourage movement potential. As a dancer herself, she focuses on the intention behind movement and the movement experience in order to make musical decisions for supporting dance. Anna also plays piano with Sexteto Cafe, a salsa band from Colombia. Pernille completed her professional dance training in Contemporary Dance and Classical Ballet, Historical Dance and Dalcroze Eurythmics. She then danced with English Dance Theatre, directed by Ross Mckim. Pernille and Anthony Van Laast founded the Peggy Hawkins Scholarship Fund at The Place in 2011 for students at London Contemporary Dance School.Pernille is now concentrating on teaching Ballet for adults and Music and Movement within Care Centres for older people and special needs. Pernille facilitates within the Dance for Parkinson's programme. In 2014 Pernille joined Musical Moving and facilitates dance classes in Wimbledon. 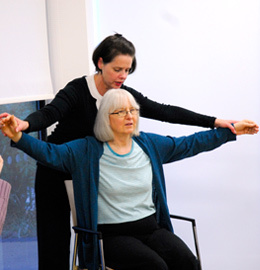 Amanda Fogg is a dance and movement practitioner working primarily with older people and those with Parkinson's. She is a founder member of the Dance for Parkinson's Network UK. 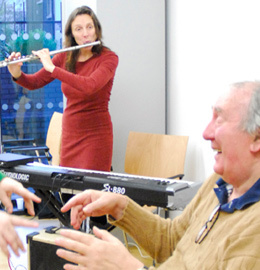 In 2011 she was awarded an Arts Council grant to deliver Innate, a project exploring ways in which live music may help initiate movement and “flow” and facilitate artistic and creative responses in class participants who have Parkinson's. After a performing career and many years running a ballet school in Dorset, Amanda's work evolved into the wider community dance field and for more than 12 years she has been running classes and workshops in Dorset and Somerset. In 2001 she was awarded a Winston Churchill Fellowship Travel Bursary to visit dance and older people's projects in America. In 2007 she received an Arts Council Grant to visit the Dance for Parkinson's outreach classes run by the Mark Morris Dance Group in New York. She has been running classes for people with Parkinson's for over 10 years and has run training sessions for practitioners regionally and nationally, including for the UK Foundation of Community Dance. In 2010 Amanda co-taught dance workshops with Musical Moving at the World Parkinson's Congress in Glasgow. She is currently a member of the Advisory Board for Life Circles, a dance project taking place across three counties in the south west. Amanda is a founding member of the Dance for Parkinson's Network UK. Marina is one of the founder members of the Kentish Town, Musical Moving Dance for people with Parkinson’s group, together with Dr. Marion North	and musician Anna Gillespie. Originally she trained as a dancer at the Laban Centre, where she developed her work in Laban Studies and choreography. Later, Marina trained as a Dance Movement Psychotherapist at Goldsmiths, University of London, where she now lectures in movement observation and improvisation. She is currently continuing her professional development by training in Integrative Bodywork and Somatic Therapy, as well as furthering her studies in the Kestenberg Movement Profile (KMP) and Movement Psychodiagnostic Inventory (MPI). Student Assistants join the class by arrangement with their institution.